Planned Maintenance Programs: Argent recommends seasonal inspections and tune-ups on all heating and air conditioning equipment. Learn more about our planned maintenance services. When it comes to your heating and cooling system, make sure you understand basic information about what each part of your system does! Heating and air conditioning systems are the biggest users of energy in the home, making up to 75% of the utility bill. A new high efficiency furnace can save up to 50% in operating costs over a ten-year-old furnace. Many 1990 and earlier model furnaces have efficiencies of 65% or less. The minimum efficiency furnace that can be sold in the United States today is 78%. Furnaces are available that are up to 96.6% efficient. Air conditioners may look similar, but check the SEER ratings when looking for your next unit. Higher SEER numbers save more money than older systems with lower SEER numbers. For example, 16 SEER can save up to half the energy used by older systems. Currently, the government requires a minimum of 13 SEER. Future legislation could raise the minimum to 15 SEER or higher. Your family should have power and heat or AC year-round, even in unpredictable, bad weather. Generators run on natural or propane gas and convert mechanical energy into electrical energy. This electricity is sent to your home so that your lights will stay on and your heating and cooling will still run. For most generators, one tank of fuel can usually supply power for up to 8 hours. You should always have a generator on hand to serve as backup in the event of any unforeseen power outages. Commercial systems and buildings operate entirely different than residential buildings. Whereas most homes have approximately the same amount of heating hours and cooling hours in a typical year, commercial buildings usually have four to five times as many cooling hours as heating hours, in fact after morning warm-up, even in the middle of the winter, most of the interior spaces of commercial buildings require cooling. Argent offers a full line of electronic thermostats to provide optimum comfort for all types of homes. Attractive designs, large, easy-to-read numbers, backlit displays and simple programming are just some of the features that make these thermostats the best choice for controlling your home. Zoning can provide optimum comfort with increased energy savings in the home by allowing multiple temperature sensing locations and control areas. 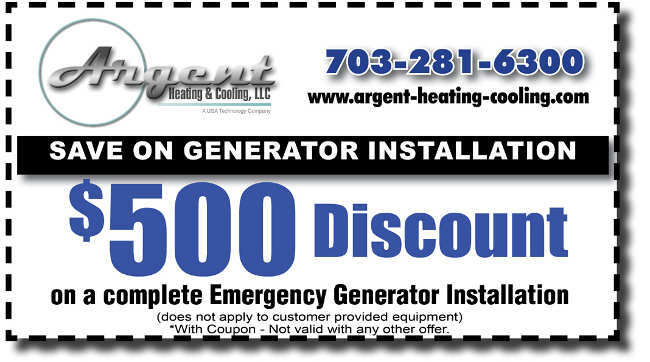 Argent Heating & Cooling, an HVAC installation and repair company in Northern Virginia has served the region for over 30 years. Our highly trained technicians are knowledgeable, passionate, and dedicated to your satisfaction. We understand the hassle that a malfunctioning or broken heating or cooling system can be, and we make it our mission to install your system or conduct repairs quickly and correctly the first time. We believe in honesty, loyalty, and open communication, and we use these qualities to drive everything we do. Don’t put up with a faulty or broken heating or cooling system. Call 703-281-6300 for a free, no obligation system evaluation!